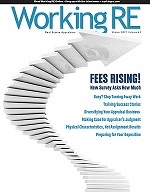 Appraiser selection by AMCs is mostly based on the lowest bid and not on quality or competency, and the fees, generally, are not adequate to keep many appraisers in business, according to the blog, survey results and the many hundreds of additional comments posted by survey takers. The type of pressure exerted on appraisers by mortgage brokers to hit values and cut corners, which HVCC is intended to curtail, is still present with AMC work, to some extent our survey indicates. And according to the survey, there may be another unintended consequence of HVCC besides driving many appraisers out of business- lower quality appraisals; appraisers who are working with AMCs report that the lower fees and faster turn times adversely effect the quality of their appraisals. While the majority of survey takers say they are “generally satisfied with appraising,” over half (51 percent) say they don’t expect to be appraising full time five years from now. Other interesting results thus far: a significant majority (73 percent) of appraisers are not in favor of the new Fannie Mae 1004MC form but a majority (68 percent) are in favor of the increased licensing and education requirements imposed by the Appraiser Qualifications Board. Find more results below. What do you say?